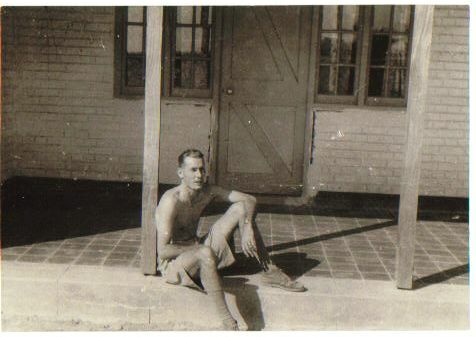 This picture is of Geoffrey relaxing at the bungalow on the outskirts of the RAF station at Wadi Saidna, a few miles from Khartoum in the Sudan. It was one of those photos that was loose in his archive, but also in a group of pictures in a small album, that I think he sent to my mother. It is 1941-2, and it’s probably around 100 degrees F (38 deg C). Geoffrey has spent a short while in Khartoum before being sent over to the RAF station, which is handling all the troops movements up to the Western Desert, as well as acting as a refuelling post for the South African Air Force. My interpretation of the arrangement was that Khartoum station looked after all the flying boat movements, and that a number of land-based planes were doing runs over what is now Ethiopia and eastern Egypt, and also coming in from Juba, ferrying incomers from the west coast. It was all a gigantic merry-go-round, and Geoffrey’s role as liaison with the RAF and SAAF was the closest he got to the desert troops. He comments in the book how sorry he felt for the troops; he was acclimatised to the dry heat, which topped 120 in the shade – and there was no shade. At midday, despite being Englishmen, they did not go out in the noonday sun. The troops, who were there for desertification, as he recalls the term, were doing manoeuvres at all hours, with full packs, additional equipment, and short water rations. His only consolation was hearing later that it helped them when it came to facing conditions under fire – they could cope, and those poor soldiers shipped straight out to Monty’s battlefield had a much worse time. One of the things Geoffrey had to do was get the mail from Wadi Saidna through to Khartoum, and when he took the truck in, he set up an arrangement with the RAF Commanding Officer to take anyone who had a day pass in with him – as long as they returned promptly! It made a deal of difference to the RAF, and the SAAF, and the goodwill lasted through to 1943, enabling him to sneak back via the bomb aimers bay in a flight of Bostons being delivered up to Cairo, after he got married. Without that help, he’d have never have made it. He rarely took photos after he went back to Africa the second time, once war had started in earnest. I think secrecy took over – as he doesn’t say much about his work either, really. It took me a long time to place this photo in the scheme of things, and once I did, I could see how thin he is, due to repeated bouts of ill-health, and poor (by our standards) diet. The photo for his pass for the RAF station makes his face look really gaunt, too. But he had a better war than many people, and for that I am truly thankful. Hope you enjoy it when you do, Julie! My father was in the RAMC in West Africa during WWll and flew on flying boat trips through Africa. He also visited Khartoum which he remembered fondly and when I was there with my husband in 1974, we sat in his hotel overlooking the Nile and felt not much had changed! I’m writing my own memoir now about my time in Africa and wanted to capture a little of his time there too. I was looking for a book that would fill in a little on the journeys – landing on lakes sounded so romantic. I think your book will add greatly to my comprehension of that time. Well done. I’m glad you found us, then, Gill. It must have been fascinating to visit Khartoum then. Although I’ve been to Egypt, I haven’t ventured further south. I think now I have such clear views of the places as they were then I am reluctant to visit the now!